Pablo… great work – have a lot of respect for what you’e been doing. Actually, I’m very grateful for what Paul has done and I wasn’t nitpicking about the size of the bed. I’m still not sure if the scene in the previous two days was her bedroom or not. That’s why I asked. I really don’t know what kinds of furniture people might have in their houses. I just went back and reread all the archives over the past two days, so now i’m coming back to comment: AWESOME. I cant’ see where this is going next, especially with what’s going on with Jin, and Tina must somehow be a part of it too. Sweet! I want to see pictures of her , when you get a chance . Am I the only one who sees a reflection of Tina’s eyes in the window down the hall? Or she’s staring at something that is staring back at her through the window. Good notice, I hadn’t seen that. … or it’s just a couple of lights or two windows in another building. Paul drew Tina at a slight angle to the window, so we really shouldn’t see her reflection in it. I recently went through Reaper Man again (by Terry Pratchett). In the book, a character dies but his spirit is unable to move on. With nowhere else to go he just returns to his old body, but rather than return to life, he basically has to inhabit/haunt it and force it to work as if he were driving a machine. Tina standing there, essentially shut down, brought that to mind. Since she really is a shell that is being ‘driven around’ by spirits/demons. I think I just figured something out (which may or may not be true). The “Main/collective” voice behaves like the seed of a soul, complete with it’s own “demonic” other voice that behaves like Shelly’s “conscience” demon, maybe both being fragments of the other demons, one “live” connection, one independent? 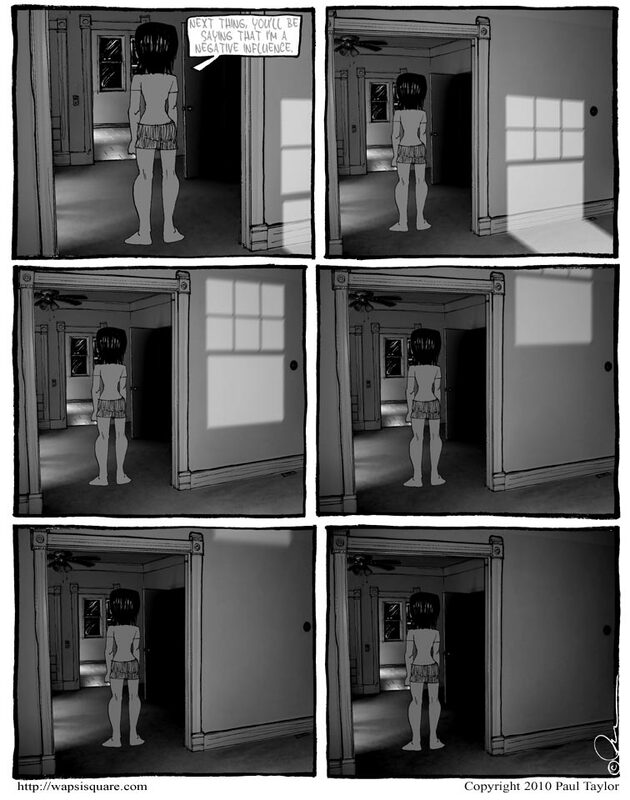 This is the creepiest comic in the whole archive.